O. C. WELCH is a prominent resident of Keyesport, Bond County, Ill., where he conducts a general store, and where he now holds the office of Justice of the Peace. The father of our subject was named Christopher Welch, and he died when our subject was only four years old. The name of the mother of our subject was Mary (McLaren) Welch, and her demise occurred one year after the death of her husband. Our subject was born in Crawford County, Ill., September 1, 1851, and after the death of his parents was kindly taken charge of by an uncle. At the age of thirteen years he left his uncle's care and started out for himself. His first arrangement was with a farmer, for whom he engaged to work on the farm for sixty dollars a year, with an opportunity to attend school four months of that time. He remained at this place for two years, and during his school days walked three and one-half miles to reach the school house. After this he hired out to work by the month, and made a hundred rails per week for his board, and worked his own way from the age of eighteen until twenty-one years of age. When our subject reached years of maturity, he and his brother Thomas engaged to work a farm on shares. December 17, 1872, Mr. Welch married Marinda Kiger, a native of Bond County. She was the capable daughter of Henry Kiger, who was one of the early settlers of this county. After marriage, our subject located in Okaw Township, one mile north of where he now resides, and here engaged in fanning and general stock-raising. In 1884, he located in Tamalco, Bond County, Ill., and engaged in the grain business, buying and .shipping all kinds of grain, and also conducted a saloon for seven mouths. In November, 1853, he started a general store in the village and remained there until December' 10, 1891, when he located where he now resides and here carries on a profitable business. Mr. and Mrs. Welch became the parents of eight children, of whom three are daughters and five are sons. Their names are as follows: Mollie B., Gifford N., Virgil W., Arthur W., William E., Lulu E., Galerd G., and Jennie May, who died at the age of two years. While living in Tamalco, Mr. Welch held the position of Postmaster for two years and nine months. In politics, he is a Democrat and has held a number of the county offices. For eight years he has been County Treasurer and Justice of the Peace, and has also held the position of Constable. In 1892, he was elected Township Supervisor, which office he is still holding. Mr. Welch is a man well known in the county, and one who has been very active in local political affairs. He has been very successful, entirely through his own efforts, and deserves the commendation of the community for his industry. 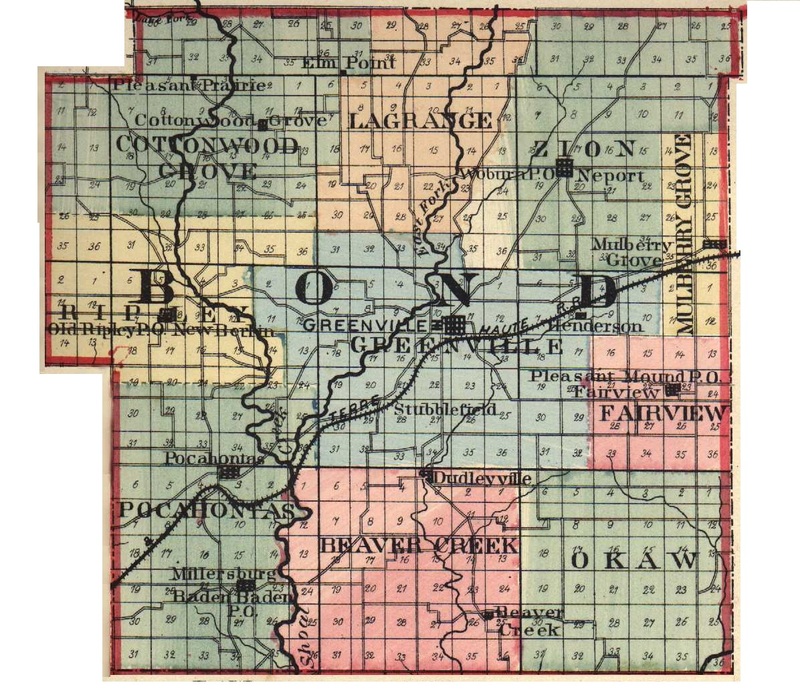 Extracted 20 Dec 2016 by Norma Hass from 1892 Portrait and Biographical Record of Montgomery and Bond Counties, Illinois, pages 386-389.